The Filipino Christmas table is always groaning with food. As part of the celebration, every one who visits is invited to a meal. It may seem a scene from nightmares to prepare a buffet for an undetermined number of guests but Christmas in the Philippines won't be the same if not done that way. 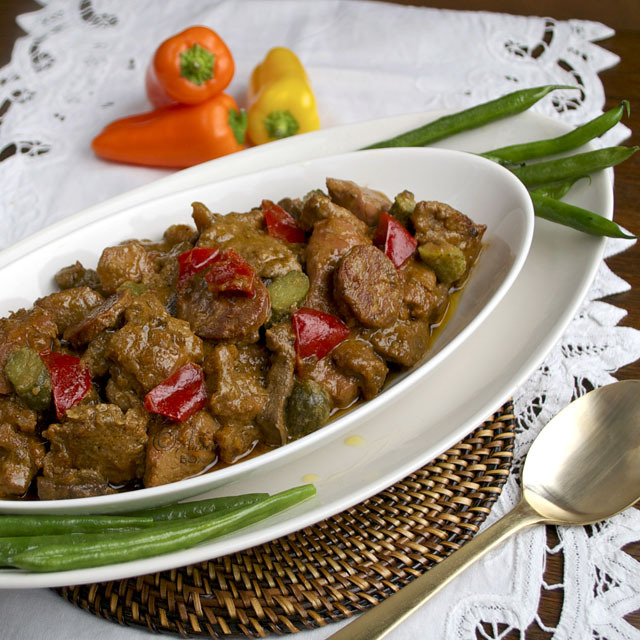 Traditional Filipino food is always served alongside other foreign or more modern cuisine. One of the popular dishes is embutido. Aside from being delicious, it is very easy to prepare. Its festive flavours make it a Christmas favourite. 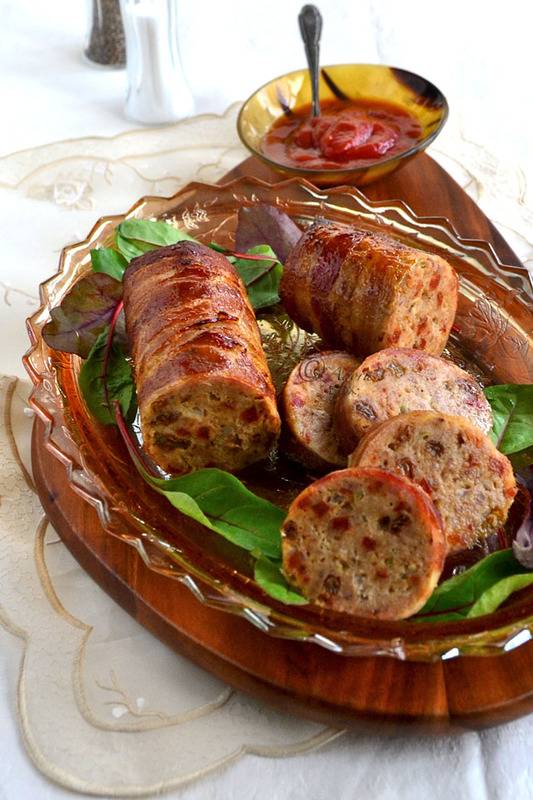 Embutido, more known as a sausage in the hispanic language, is more like a meat log or meatloaf in Filipino cuisine. It probably is called so because the word stems from the root word embutir which means cram, inlay or stuff. It all makes sense because embutido is very similar to a stuffing mix. 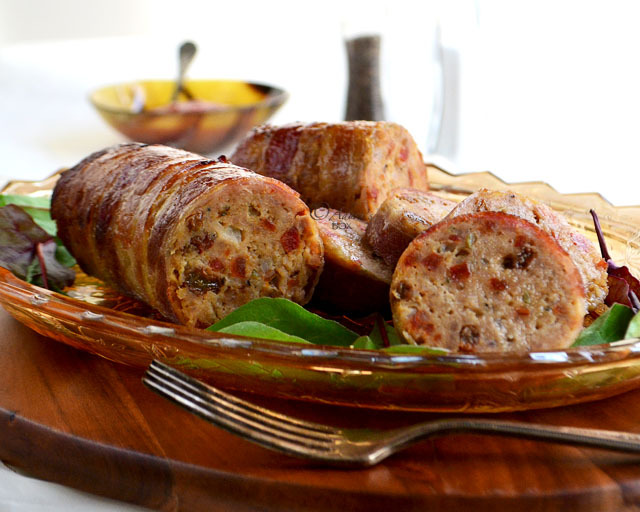 When cooked, the bits of chorizo, pickles and sultanas form beautiful specks on the pork and sausage meat. Just looking at it, it becomes apparent that it is crammed with flavour. In the olden days, caul fat was used to wrap the mixture which was then steamed to cook. It is briefly browned in a pan, rendering the fat, before slicing and serving. 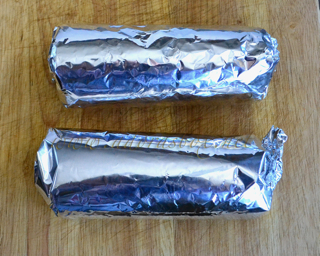 Nowadays, aluminium foil is the easiest wrapper to use and results to a perfect log. Baking is the easiest way to cook it. My recipe for embutido borders on the classic recipe but I have added chopped chorizo sausages and sherry to the mixture for added flavour. 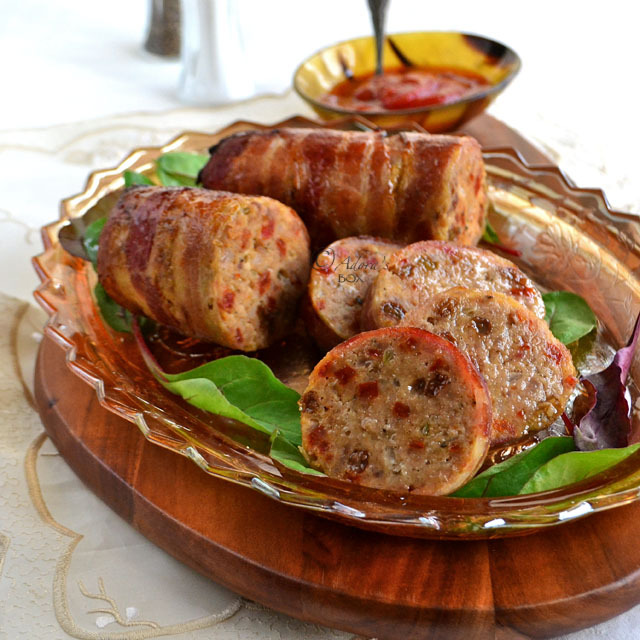 I have also used streaky smoked bacon to wrap the logs and that added a special flavour to the dish and made it more festive. 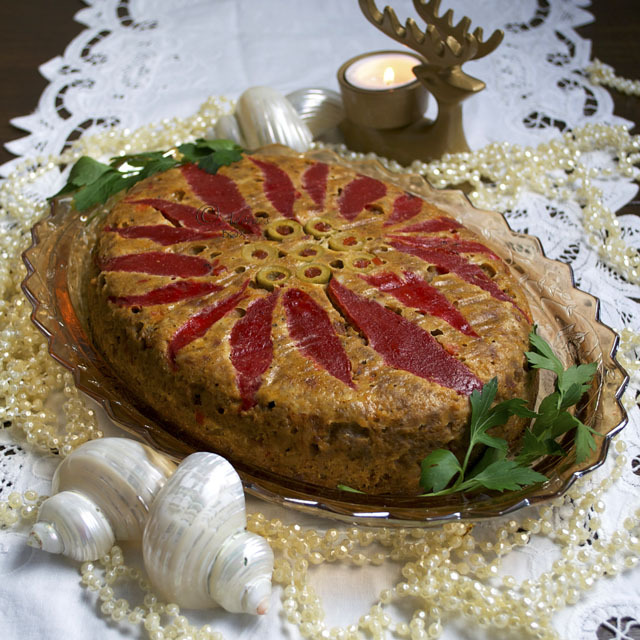 It is a very easy dish to make and a good standby for Christmas because it can be cooked ahead and frozen. Although it is usually served with rice, my favourite way of eating it is between slices of white bread, with lashings of mayonnaise and a squirt of ketchup. 3 fresh sausages (I used English sausages), 225 gms. Put the chopped onions and 2 tbsps. of butter in a bowl. Microwave for 2 minutes until the onions are soft and translucent. You may cook this in a pan on the stove top if you prefer. Put the minced pork in a mixing bowl. Peel off the sausages and add the meat to the pork together with the rest of the ingredients except for the bacon rashers. Mix all of the ingredients thoroughly. Check the seasonings by cooking a spoonful of the mixture in a small bowl for 30 seconds in the microwave. Season to taste if needed. The seasonings I've used in this recipe was just right for me but ingredients such as sausages, chorizo and cheese vary in degree of saltiness so will affect the taste of your mixture. The bacon also has salt in it so it is better to under salt your mixture a little bit. Refrigerate the mixture for an hour to firm it up and let the flavours develop. You will need kitchen foil and greaseproof/baking paper for wrapping. Lay a sheet of foil on a board or tray. Top with a sheet of greaseproof paper. Grease the paper well with softened butter. Arrange four bacon rashers side by side on the paper. Divide the meat mixture into four equal portions. 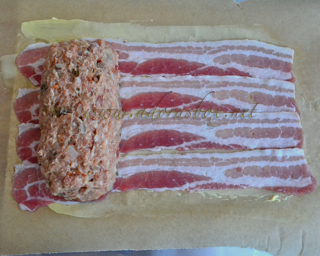 Scoop out a portion of meat on the short end of the bacon strips and form into a log. Using the paper, roll the bacon around the log. Put the finished log in the middle of the paper and let the short ends meet. Roll the paper around the log. Wrap the log in foil and twist one end to seal. Stand the roll on the sealed end and give it a few gentle taps to expel air before sealing the remaining end. Lay on a baking tray with a rack. Pour water on the tray and bake the rolls on the rack for 50 minutes. Peel off the wrapper and bake the rolls for a further 10 to 15 to brown the bacon. Let rest for 20 minutes before slicing. Serve with ketchup. How lucky I would be if I am part of your family.... and very often I be able to enjoy delicious meal from you. I think the word delicious is not enough to fit....it should be super super delicious ..."naghahanap napaka masarap"....slurrrppppp and I am drooling looking at the bacon. I will try to make this one day. Hi Mel. Your Tagalog is getting better and better. You'll be more fluent than I am soon. Are you inviting us over for Christmas party?! LOL! Hi Chef! It would be my pleasure to have you at my party but better if I can come to one of your fabulous ones. If I had all of the ingredients I would be in the kitchen making this right now! 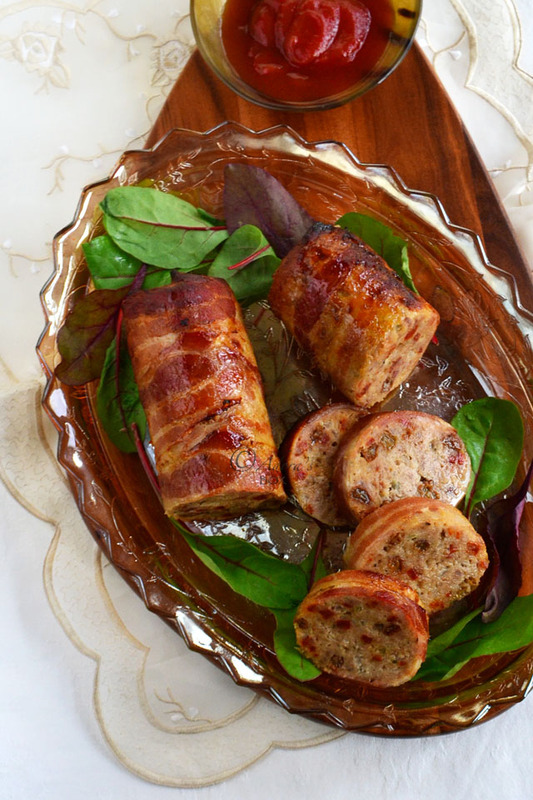 I love the way you made sausage from sausage and then wrapped it in bacon! I'm making a grocery list right now. Thanks for sharing this great recipe! That's my favourite way of eating it, Allison. With lashings of mayo and topped with ketchup. Can i wrap it directly with the foil instead of using the paper wrap and butter? Will the bacon stick to the foil wrap? thanks! 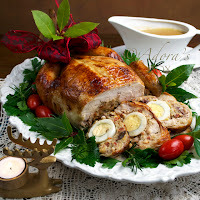 grateful to see your blog as i have new twists to the recipes i love cooking and gives me lots of ideas for Christmas Noche Buena! Hi Doc! Glad you found my blog. You can omit the bacon but still grease the foil with butter to prevent it from sticking. 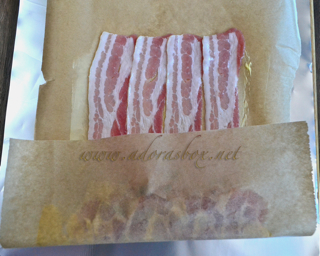 No the bacon won't stick to the greased foil.